Sir Charles James Lawton Wingate (1846-1924). Born at Kelvinhaugh near Glasgow in 1846, Wingate's career as a boy clerk in a Glasgow commercial house was overshadowed by his taking drawing lessons in the early morning before work. Ruskin's Modern Painters and Elements of Drawing were a stimulus to him, as was the Pre-Raphaelite tradition, as seen in Scotland in the paintings of Waller Paton. From pencil studies, he constructed watercolour drawings which he exhibited for the first time in 1864 at the Glasgow Fine Art Institute. The appreciation he received for his work induced him to give up all thought of a commercial career and with £70 as his savings, he went on a six months tour of Italy (1867-68), where he studied the works of the great masters and for the first time painted directly from nature. The tour resulted in the production of about 150 watercolour drawings. After his return to Scotland he based himself in Hamilton for about five years. The neighbouring Cadzow Forest, beloved by Sam Bough and Alexander Fraser, gave him the opportunity of careful study of tree forms, of which he made excellent use in later life. He then moved on to Edinburgh, where he studied at the RSA Schools. The turning point in his career came through meeting Hugh Cameron at Comrie, in Perthshire, in the autumn of 1873. Cameron was a genial and helpful critic. Wingate sturdily defended his work as being true to fact; Cameron's reply "I feel the work to be wrong and art is not an affair of argument, it is an affair of feeling" struck him with irresistible force. 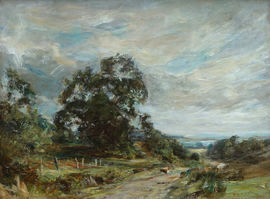 In 1874 he went to Muthill, near Crieff, in Perthshire, painting rustic subject matter such as 'The Wanderers' and 'The Quoiters', which drew public attention. 'The Wanderers' ensured his election to Associate rank in the Academy. From 1880-86 he made Muthill his home and in the later years he gained full membership of the Academy. Later he moved to Colinton and afterwards to Slateford, both in the vicinity of Edinburgh and 1913 he came to the capital. 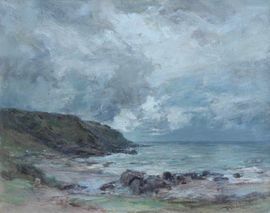 Thereafter he came increasingly under the influence of William McTaggart and his style became much more free, although with the same affection for the Scottish Countryside. The sky as the source of light, treated by so many painters in a perfunctory way is with him all-important. 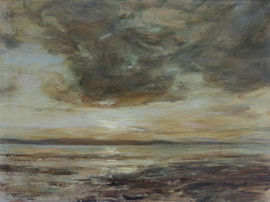 He exhibited at the RA from 1880, but showed mainly at the RSA from 1865. He became President of the RSA in 1919, resigning shortly before his death in Edinburgh, aged 78.